How I Gained It: A childhood trauma led me to binge on food to cope with my feelings. I became addicted to food; it became my emotional crutch. Coupled with zero physical activity, my weight continued to balloon well into my teens. My early 20s were a haze of fast food, beer and late-night snacks with friends. Before I knew it, my weight had ballooned to over 350 pounds. I was unrecognizable in photos, uncomfortable in my skin and suffering from chronic pain in my back and knees. Breaking Point: After losing 60 pounds in 2005, I quickly gained it back (and more) due to continued bad habits. In 2007, I was told by a doctor that I was at a high risk for diabetes and high blood pressure due to my lifestyle. Not wanting to take medications or face serious health consequences, I decided to make a change. How I Lost It: The change (which included moving from a rural area to a city) enabled me to ditch my car and begin walking as my primary mode of transportation. In my first week of effort, I lost 11 pounds -- and I never looked back. In that year, I lost nearly 100 pounds through steady exercise and a consistent diet. I began reading Men's Health and became fascinated with their "Eat This, Not That" section. At my heaviest, I paid no attention to nutrition labels or serving sizes. I learned everything from how many daily servings of fruits and vegetables I should consume to how many times a day I should be eating. Over time, I moved processed foods, fast food and soda out of my diet. I owe a lot to planning my meals and packing my lunch daily versus eating on the run. Over the next four years, as the weight loss took pressure off of my knees, I incorporated the gym into my routine, using the elliptical machine regularly. Spinning classes followed soon after, and, in 2012, I ran my first half marathon. 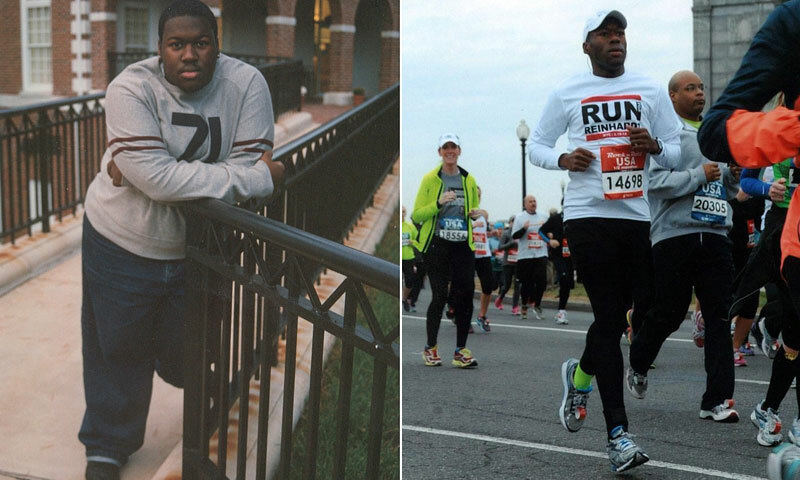 After two more half marathons, I was down another 75 pounds, bringing me to a weight I had not been since I was 12 years old. Today, I work out three to four times a week, mixing cardio with strength training. I'm also very fortunate to have friends who are just as active and rally each other to participate as a group, which has kept me accountable. Most days, I walk to and from work, which alone amounts to over six miles a day. I also depend heavily on fitness and food trackers to help me stay on target, sometimes logging nearly 30,000 steps a day! I allow myself to enjoy food and work to not worry about the occasional indulgence. The difference now is moderation and knowing that I will need to "pay the toll" by planning a workout beforehand. It has become the most fulfilling experience of my life to give support to others, whether it be via blogs on my website, sharing inspirational quotes on social media sites or responding to the emails from those seeking guidance. It is my way of letting others know that success is possible. After Weight: 175 pounds. At my lowest, I reached 165 pounds, which didn’t really fit my frame and was unsustainable from a calorie perspective.